When a dog becomes a senior depends on their breed and body weight. Usually, it's around halfway through their life expectancy. That's sooner for large breeds than small dogs. Little dogs usually live between 15 to 20 years, but bigger breeds only live between 12 to 15. Just like people, many older dogs need less calories, since they're less active, and their metabolisms are slower. They also might need more fiber to improve gastrointestinal function. Not every older dog becomes overweight, but certain health problems become more common. 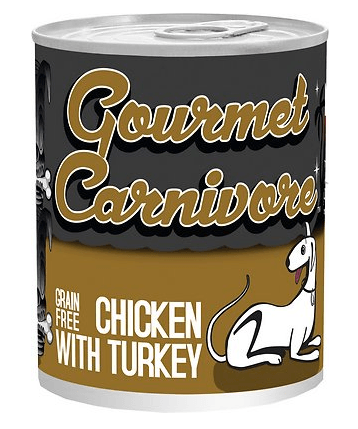 Canned food is the best dog food for older dogs, just as it is for any dog. It's important for kidney, liver and urinary tract health for our pets to get enough moisture every day. That's just not possible on dry dog food alone, which is nothing like what they would naturally eat. Tiki Gourmet Carnivore has a protein profile very close to wild prey. The human-grade, shredded or sliced meat and seafood are extra digestible for seniors, with nutrients that are easy to absorb. The recipes are grain free, free of gluten, flour and starch, as well as artificial colors, flavors and preservatives. Protein accounts for 55 percent of the calories, while another 35 percent come from fat. There are absolutely no carbohydrates, so ther’s a zero glycemic index. 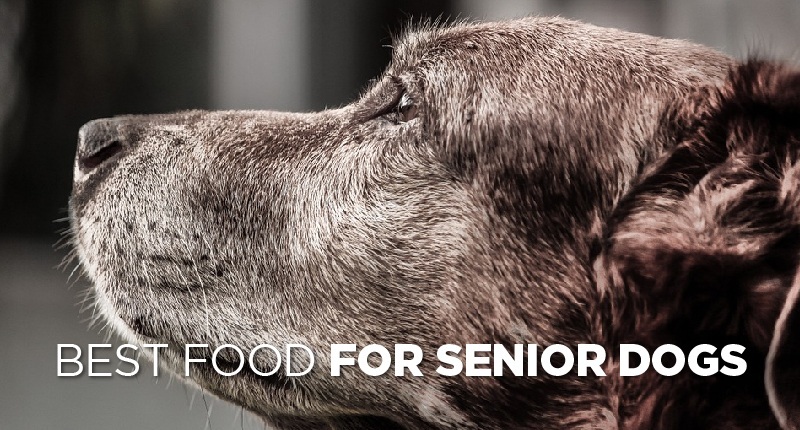 This dog food brand provides a very high-protein diet to help your dog thrive as a senior. The meat is simmered in a consommé broth, using a traditional stock method, for maximum moisture and taste. Olive oil, vitamins and minerals are then added. It's especially good for dogs that need to watch their blood sugar. The way this healthy dog food is made is the closest thing you can get to making your own homemade dog food. You know exactly what ingredients it is made of, so you do not have to question what is going inside your dog's body. 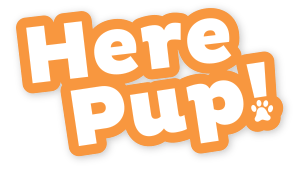 You never have to worry if your dog is getting the adequate nutrients if you feed them this. It is the best dog food for senior dogs on my list! The best dry dog food for older dogs will always focus on high-quality protein and grain free ingredients. That’s what Orijen adult dog food is famous for. It’s undoubtedly why this is commonly the top rated senior dog food online, and why it has the best senior dog food ratings. As dogs get older, they metabolize protein less efficiently, so the quality is even more important. It maintains your older dog's body weight and encourages lean muscle mass, without stressing healthy kidneys. 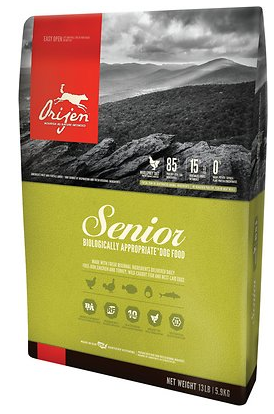 Orijen Senior Grain-Free Dry Dog Food has all the meat older dogs need in their diet, without too many calories. Free-run chicken, turkey, whole eggs, and sustainably-caught fish form 85 percent of the ingredients. The amount of meat, fish, and eggs, compared to animal organs and cartilage is Biologically Appropriate™ too. Two-thirds of the meat in Orijen dog food is fresh. The rest is air-dried at low temperatures, concentrating its protein value. There’s no rendered poultry meal. Only 15 percent of the ingredients come from low-glycemic fruit, vegetables and other botanicals. Freeze-dried liver adds more flavor, which can be an added bonus when older dogs seem to lose their appetite. There are no artificial preservatives and very few synthetic supplements because they’re already present in the natural ingredients. Zinc is the only thing that needs to be added. Some senior dogs need lower-calorie formulas if they're less active or to lose weight. They might need less salt too, especially if they have preexisting heart problems. Less protein is also recommended if a dog already has weaker kidneys. 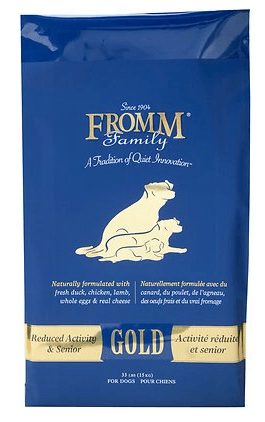 Fromm Gold Holistic Reduced Activity & Senior Dry Dog Food, meets the needs of such dogs. It combines duck, chicken, eggs, lamb, and cheese with chicken cartilage for older joints, easing inflammation. There are probiotics as well, for the digestion, and salmon oil for healthy skin and fur. Yucca Schidigera actually reduces smelly stools too while chicory root reduces the risk of parasitic worms. There are so many helpful and effective ingredients that work to improve your dog's overall health and life in this dog food! Fromm’s dry dog food products are made in small batches, without the corn, wheat or soy, which many dogs are allergic to. Carbohydrates instead come from oatmeal, brown rice, pearled barley, millet, white rice, flaxseed and alfalfa meal, as well as fresh produce. Flaxseed also has high levels of omega-3 fatty acids and soluble and insoluble fiber for better digestion and stool consistency. 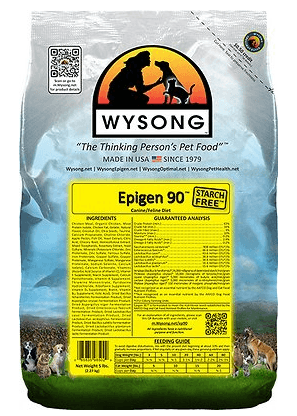 Because of its higher glycemic index, I wouldn't recommend this food for diabetic dogs. Diabetic dogs need a diet where food is broken down slowly, so their blood sugar does not rise. Limiting carbohydrates and starch keeps the glycemic index low. A high fiber dry dog food can also be beneficial in order to keep their blood sugar low. Many dry dog foods are much higher in starch and carbohydrates than they should be. This dry dog food is 90 percent meat. Talk about a high-protein diet! Some of it is even organic. Wysong uses special extrusion technology that doesn’t require common fillers and binders. Just replacing grain with potatoes, peas and tapioca can be even less healthy because there’s more starch. That’s just a marketing ploy. Starches and carbohydrates are cheaper, but dogs don't naturally eat a lot of them. The formula also includes probiotics, prebiotics, enzymes, phytonutrients, nutraceuticals, and natural antioxidants too, as well as all the vitamins and minerals dogs need. Epigen™ features biologically high-value potato protein isolate and meat protein isolate from pork. They are easy to absorb, which is really great for older dogs prone to muscle wasting sarcopenia. It separates protein from carbohydrates, starch, lactose, fat, and cholesterol too, as 95+% pure. Most common issues for food sensitivity are also avoided. How a food is prepared has a lot to do with how healthy it is and the availability of its nutrients. Most dry dog foods are extruded and cooked at high temperatures because it's faster and cheaper. Air-dried dog foods are a recent alternative that’s more convenient than raw, freeze-dried or dehydrated products because there’s no need to thaw them or add water. Many senior dogs have arthritis or joint pain. Dog foods with added glucosamine and chondroitin sulphate can help. Some older dogs need to lose weight too, but not all. As they metabolize food less efficiently, they lose muscle tone. In that case, they actually need more calories and better quality protein. 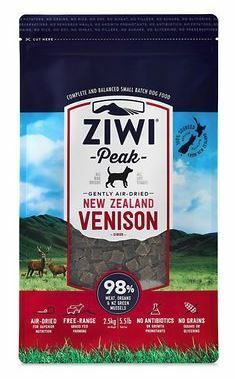 Ziwipeak Air-Dried Venison & Fish Dog Cuisine is 92 percent meat. The New Zealand venison includes the liver, lungs, tripe, heart and kidneys, and there's hoki fish and green-lipped mussels too. That means the glucosamine and chondroitin comes from natural sources, so it's easier to absorb. These ingredients are great for the skin and coat, as well as renal issues. Because the protein sources aren’t the more common ones used it's better for allergies and digestion issues, like IBS & IBD. Kelp, parsley, chicory inulin and lecithin form the remaining 5 percent of the ingredients, adding more natural essential vitamins and minerals. It is naturally preserved too, with Mixed Tocopherols without artificial flavors or colors. There are no cheap fillers like potatoes, sweet potatoes and pea protein or grains, like corn, wheat, rice or soy. It also has no rendered meats, meat meals or a meat by-product. There’s no added salt, sugar or glycerines either. There is no single answer when it comes to what is the best senior dog food. All of the best senior dog food brands do have certain things in common though and that’s high quality, natural ingredients and protein. If your older dog is already eating an adult food like that and they’re doing well, you might not need to change their food at all. That’s why the AAFCO (Association of American Feed Control Officials) and the National Research Council (NRC) do not give special guidelines for what is the best dog food for senior dogs. To find a high-quality dog food for your older dog, you will need to move beyond that simple senior label, and feed them the right amount for their weight. 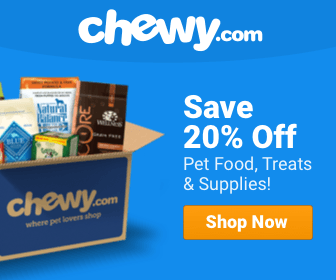 Best Raw Dog Food – Top Picks & Comparisons!